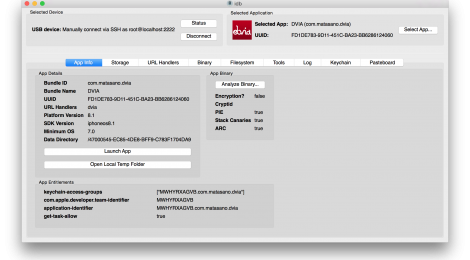 Browse: Home / idb v-2.7 released: is a tool to simplify some common tasks for iOS pentesting and research. idb v-2.7 released: is a tool to simplify some common tasks for iOS pentesting and research. 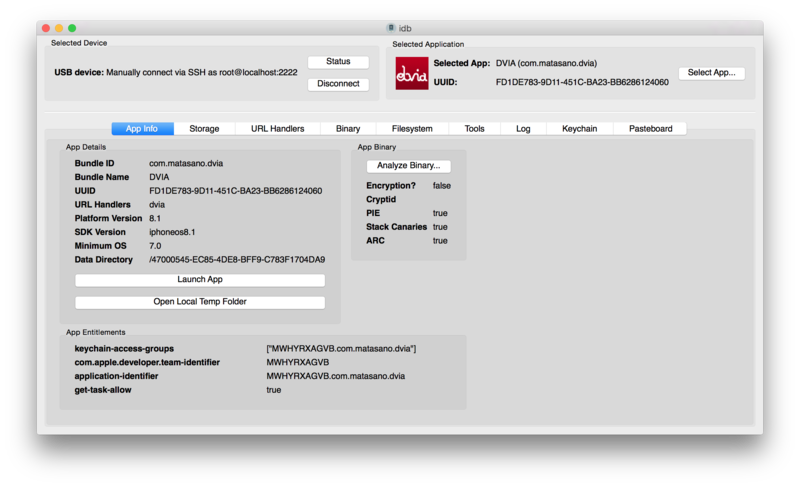 idb is a tool to simplify some common tasks for iOS pentesting and research. Originally there was a command line version of the tool, but it is no longer under development so you should get the GUI version. The screen shot utility is a simple wizard that can be used to test whether an app is disclosing sensitive data in the automatic backgrounding screenshots taken by iOS. Installing new CA certificates on the iDevice can be cumbersome at times. This function aims at making the process faster by automatically making the respective certificate accessible to the iDevice. The /etc/hosts file editor provides a simple way to modify the host applications connect to. In order to intercept traffic for an app, one would typically use a tool such as Burp Suite and set the iOS system proxy to make the app connect to it. The Log tab can be used to view the syslog of the iDevice. Besides system messages, it also includes any log statements that apps produce using NSLog which often disclose sensitive data. idb requires a valid ruby 1.9.3 or 2.1 installation and it is recommended to install the used ruby using RVM. Ruby 2.0 does not work properly due to issues with qtbindings. + Under rvm use rvm install 2.1 –enable-shared when installing ruby. + Under ruby-install/chruby use — –enable-shared when installing ruby. + Under ruby-build/rbenv with ruby-build use CONFIGURE_OPTS=–enable-shared [command] when installing Ruby. — Note: Running bin/idb directly won’t work since it will not find the idb gem (or use the installed gem and not the checked out source code). Instead, the bundle exec command runs idb in the current bundler environment where bundler supplies the gem from source. ← Updates Libtins v-3.2 : a high-level, multiplatform C++ network packet sniffing and crafting library.